Beetle Bingo - Bingo Forever! Powered by Playtech, Beetle Bingo is a unique mix of a traditional bingo and a scratch card game. Cash wagering which can range anywhere from the starting bid of $0.50 and extends all the way up to a maximum bet of £/€10 per game. The player makes the wager and then scratches the three panels on the scratch card that is provided. Once all the panels are scratched, the player then shakes the bottle containing the numbers. The computer then picks 15 numbers at random. These numbers are then compared with the numbers on the card. If you're lucky enough to match all five numbers on one card with those of the beetles, you'll win. The prize for each card will show below the card's numbers and because you have three cards, there are three chances to win. You can also choose to use the autoplay function, which will let you play up to 99 games of beetle bingo automatically at any time you like. This makes it incredibly easy and fun to play - all you need to do is collect your winnings! This very colorfully animated game doesn`t offer any bonuses or the progressive jackpot. 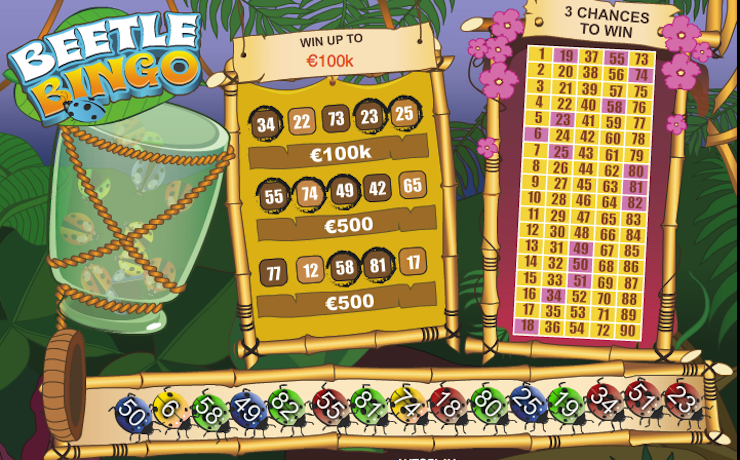 Playing this game, you have a chance to win the hefty amount of up to €/$500.000. Beetle Bingo is a cheerful game, which is getting boring if played as a trial version. So play for real money and enjoy excitement! Moreover, players who choose trial version are not eligible for any of the prizes.